Protecting Restaurants for Over 20 Years! If you own a restaurant, then you understand the importance of protecting	your assets and ensuring a safe and comfortable atmosphere for your guests	and employees. Our UL 300 kitchen hood system is often our go-to solution	to help keep commercial kitchens safe. In the past, kitchen hood systems	had relied on dry chemicals to extinguish grease and stove fires from	kitchens, yet these methods were often ineffective. The UL 300 uses wet	solvents and chemicals to extinguish dangerous kitchen fires in a timely fashion. Stop kitchen fires the moment they start! 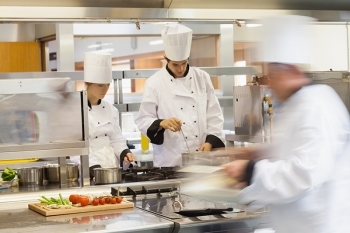 Installing a UL300 fire suppression	system can help save your restaurant and protect your employees and guests	by minimizing the impact of a commercial kitchen fire. As your local fire	suppression specialist,	call us at (909) 483-9789 and schedule an appointment with our knowledgeable staff today!